When we received the Spring Summer 16 lookbook of Jump From Paper a few weeks ago, it almost seemed natural to us to write something about it. 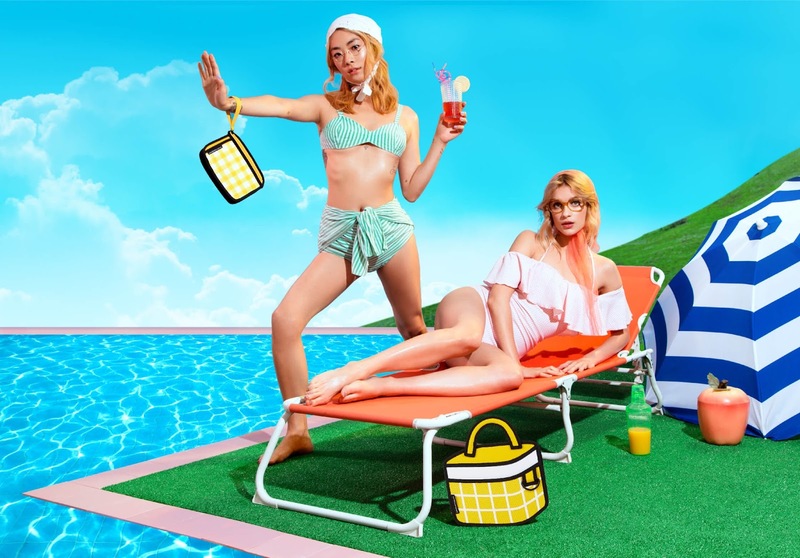 This brand is so fresh and cool and to tell you the truth, it is always such a pleasure to write about their fun accessories. We love fun-fashion brands whose bold designs drag you to another world. Their Pop Art simple creations have an incredible power of attraction that is quite inexplicable. Carrying their bags in the streets is always a fun experience regarding the people's reactions: "Are they for real??" "Are my eyes deceiving me??" "Where can I buy them??" "How much do they cost??" Apart from their uniqueness, these bags are made for people who are not afraid to express their personalities, who love to play with fashion & who are not afraid to wear vivid primary colors! These colors are statements just like weapons against the gloomy winter! Don't hesitate to wear colors in winter! Be bold ! Be irreverent! Wear colors in Winter and above all, choose a Jump From Paper bag, it will make your days happier & cooler! 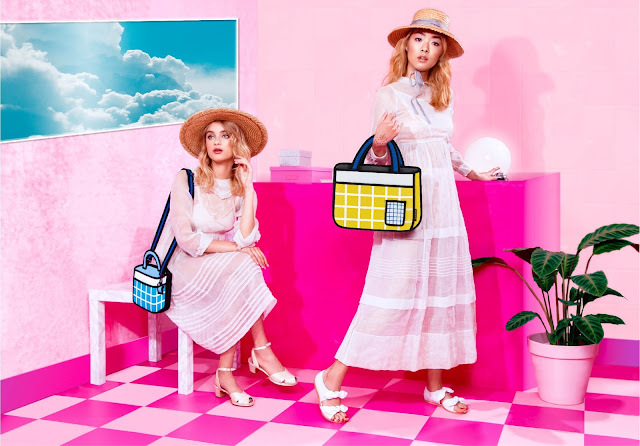 To present & launch their SS16 collection named Dreamy Picnic, the Tapei based brand chose New York and more particularly a Brooklyn art gallery where a crowd of cooler than cool guys were invited to share a kind of neo-indoor picnic (Who doesn't love a cute picnic?) imagined jointly by the Jump From Paper team & curator Grace Miceli who, rightly enough, defines the bags as "wearable art". So, in a bucolic meets kawaï setting (including green grass on the floor, cute clouds on the ceiling & picnic snacks), the lucky guest could discover the brand new collection composed of a backpack, a tote bag & a crossbody bag, all of them in vivid checked print (red, yellow, blue or pink). Life is definitely always a party with Jump From Paper and they surely know how to throw a party. We hope someday they will come to Paris (or return to London as we will move to the British capital in a few months) to launch a future collection because it will be a huge pleasure to be part of such a celebration. We love free-spirited brands that stick to a particular aesthetic and imagine a whole universe around it. 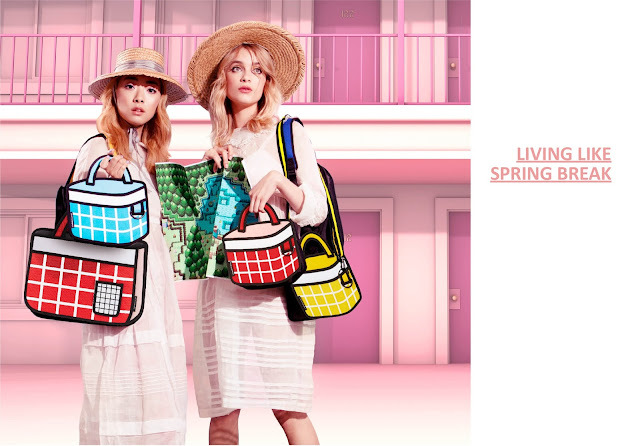 When we looked at the lookbook, Yann & I wanted to part of these acid pop/retro holidays! We too wanted to have a picnic on a pink gingham blanket or enjoy the sun in a foreign & quite surreal resort! For our next holidays in Brussels & Amsterdam, we can totally picture ourselves with the super-cute backpacks (trust us you can put a few things into them, you'd be surprised!). Jump From Paper is all about inventiveness, innovation & craziness. Three things that really matter for us when it comes to Fashion & accessories. You may think that we are often (and let's admit it most of the time) wearing black or dark colors but don't be mistaken, we know how to put a flash of POP! 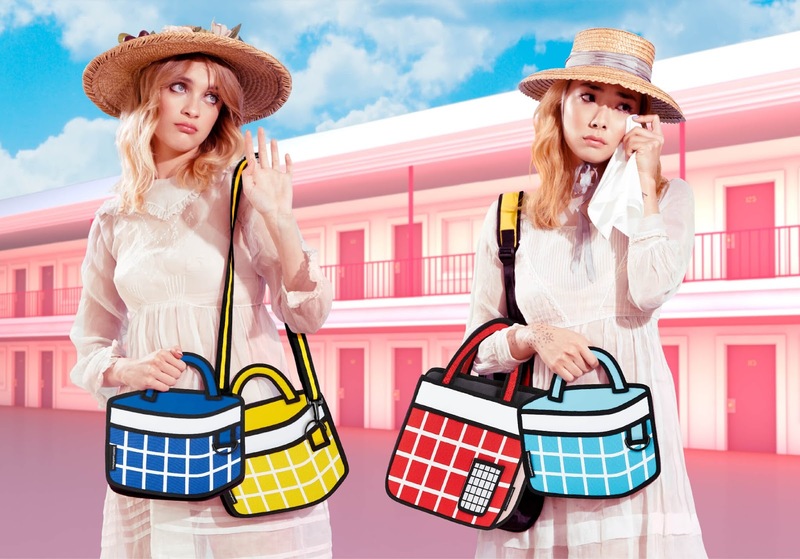 into our outfits and these "modern classic" bags are just the perfect solution to do so! After all, life is too short to be boring & uninspired! If you want to have a look at the 1st articles we wrote about Jump From Paper, it's HERE and HERE!